Research Issues. The 2RAR logs available on-line are hand written and generally messy to read and difficult to understand. Night locations were not recorded for several days in the month. Many gaps in the timeline have been filled by using detail reported by 2RAR/NZ to the 1ATF CP. The 2RAR/NZ logs in their unedited state do offer some insights into unit operational thinking. Summary. 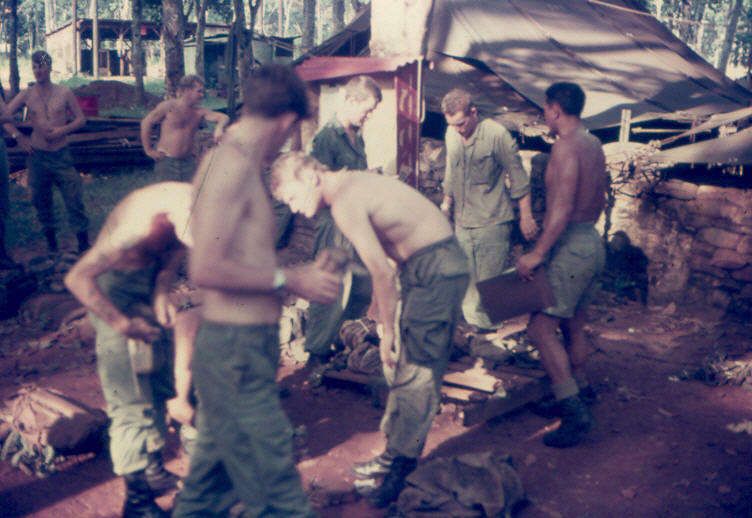 W Coy started and finished October 1970 working from their lines in NUI DAT. For the first week of October W Coy were the 1ATF ready reaction force. During this period when not on sentry, patrolling or being called to react to VC sightings the troops relaxed in an attempt to regain health, tidy up the lines and anticipate their withdrawal back to Singapore. When they returned to AO JUDY [centre of mass YS360700] on 8 October, there were only three weeks of operations left in the 12-month tour. There was only one contact with VC in October 1970. It is likely however that October is remembered by many veterans mainly for the accidental wounding of four servicemen, one of whom succumbed to his wounds. This in turn will confuse in many memories the proud record of service attained in the previous eleven months. The accident has been researched and is only lightly covered in the timeline as all the detail can be read here. 1Pl assumed the ready reaction role again following 2Pl's deploy ment at 1010H, however with the arrival of the 1Fd Sqn combat engineer team [with 600lbs of HE] 2Pl were stood down and returned to NUI DAT during the afternoon. 1445H 3Pl, Ready Reaction platoon on 7 and 8 October, were warned-out to assist a SAS patrol who had located a cache of VC weapons hidden in a well. 3Pl were advised they would remain in the field and rejoin W3 Coy after 9 October. This task was later cancelled. Late afternoon 3Pl was again warned-out to guard a crashed Australian helicopter, but stood-down without deploying at 1920H. 1015H 3Pl were warned-out to support C Coy who had located a large VC camp. HQ 1ATF issued the order to deploy at 1031H and 3Pl were located with C Coy YS348758 at 1110H. 3Pl were c/s16 on the 1ATF comd net but on arrival at C Coy were directed to flick frequency to the 2RAR comd net as c/s53 and act as a radio relay between 0A [Bn HQ] and c/s30 [C Coy HQ]. 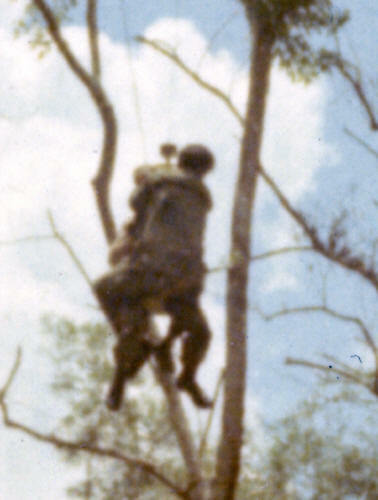 It is both an irony of jungle warfare that 3Pl could get comms to 0A from the same area as C Coy when C Coy had no success, both having the same radio equipment, and a testament to the skill of the 3Pl W Coy radio operators. W Coy passed the ready reaction role to V5 Coy at noon and deployed by air at 1500H to blocking positions south and SW of C Coy. 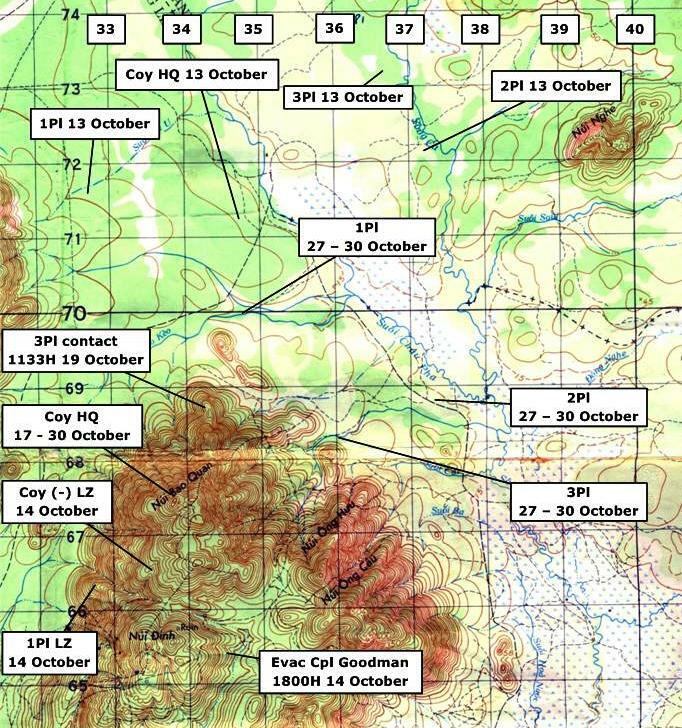 3Pl activities, and those of W Coy for 8 and 9 October are covered in detail at his link. 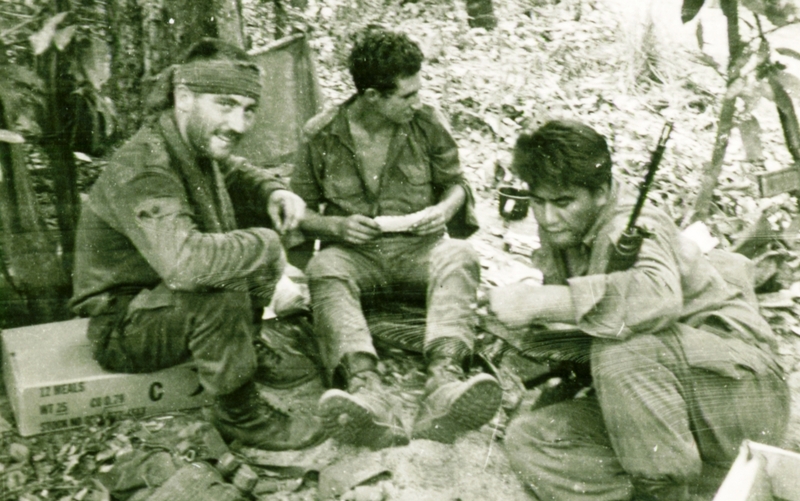 It had been 2RAR's intention [as at 1300H] for 3Pl to be released from supporting C Coy and to move west to the area of the fire trail but this was changed during the afternoon. Night Location: Coy HQ YS328722, 1Pl YS322724, 2Pl YS340730, 3Pl YS347758 [co-located with C Coy]. 3Pl activities for 8 and 9 October are covered in detail at his link. In outline 3Pl took a tracker dog team to where 40 VC inflicted casualties on 8Pl C Coy on 8 October to then follow the track of the VC party the following day. The remaining W Coy elements remained in their designated blocking positions in hope that a VC party would blunder into their ambush. 3Pl activities for the morning of 10 October are covered in detail at his link. In outline 3Pl followed the tracker dog team along the route the VC party had used after the 8Pl contact. 1215H at YS360739 3Pl report being in contact - after a period of confusion the report was changed to a 'blue on blue' accident. Four soldiers were wounded before it was realised that the platoon were firing at themselves. 3Pl activities for the afternoon of 10 October are covered in detail at his link. All four casualties were winched from the location around 1300H and flown to Australian or US hospitals. 2Pl joined 3Pl to provide support and added protection in case the VC party being pursued was still in the vicinity. An official investigation into the accident began, the investigating officer being Capt Jim Brown MC, the former 2ic of W Coy. 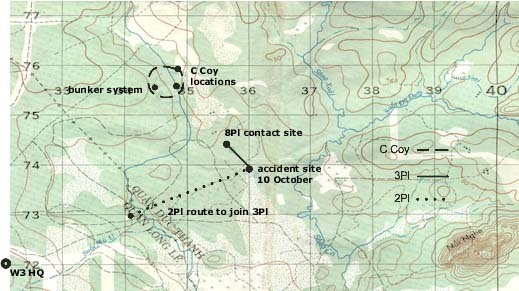 There is no mention of the 3Pl accident in the 1ATF daily SITREP for 10 or 11 October [which may explain why the incident is not mentioned in Lt Col Church's book], nor is there a mention of friendly losses however the accident is covered in detail in the 2RAR/NZ CP log and mentioned in the 2RAR/NZ After-action Report for Op CUNG CHUNG III dated 18 Nov 70, page 146. 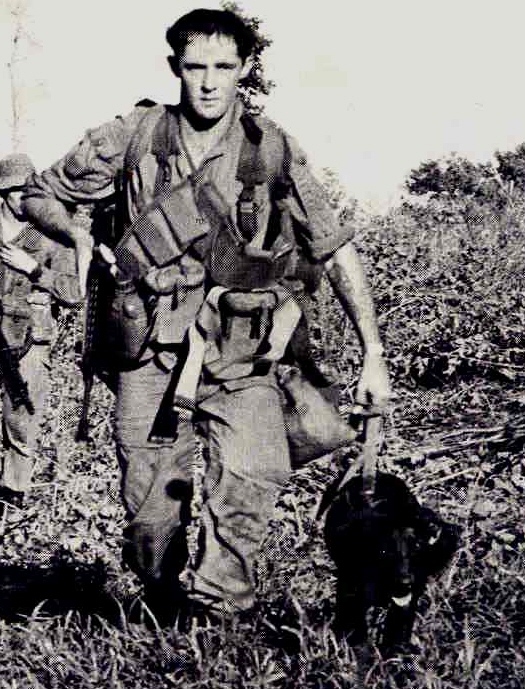 News was received that Pte Tom Cooper had died of his wound at the US 24th Evacuation Hospital at Long Binh. 2Pl left 3Pl in location during the afternoon and patrolled south in the direction taken by the original VC party. 3Pl took a MAINTDEM during the morning and then moved south. 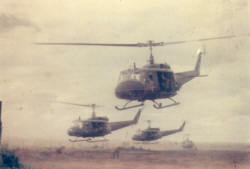 The tracker dog team was withdrawn back to NUI DAT on the MAINTDEM helicopter. 1245H locstats: 1Pl YS325717, 2Pl YS371721, 3Pl YS368732. 1405H locstat ptl 2Pl YS374722. 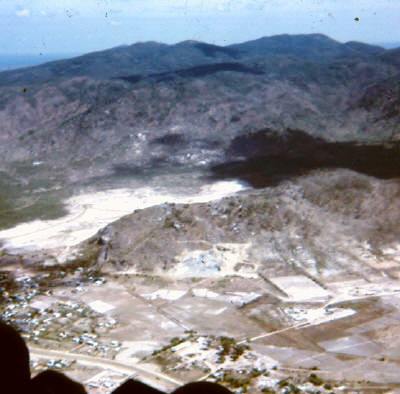 1750H Arty comd 1ATF advised arty and air cells that location YS3366 [1km north of the NUI DINH peak] was a non-fire zone as W Coy were to deploy 14 October into the area. W Coy was warned out for an air insertion to secure a suspected VC location at YS335665. 1Pl would be inserted into a block position at YS3266, the remainder would be inserted at YS335665. The LZ for the block force would be assaulted by Bushranger LFT while the main company LZ would be 'prepared' by artillery with Bushranger support. At 0800H a section of 107 Bty was moved from FSPB LE LOI back to NUI DAT to be in range and operational by 0830H. Night Location: Coy HQ YS347713, 1Pl YS327716, 2Pl YS374722, 3Pl YS369732. W Coy was inserted into the two LZ during the morning. 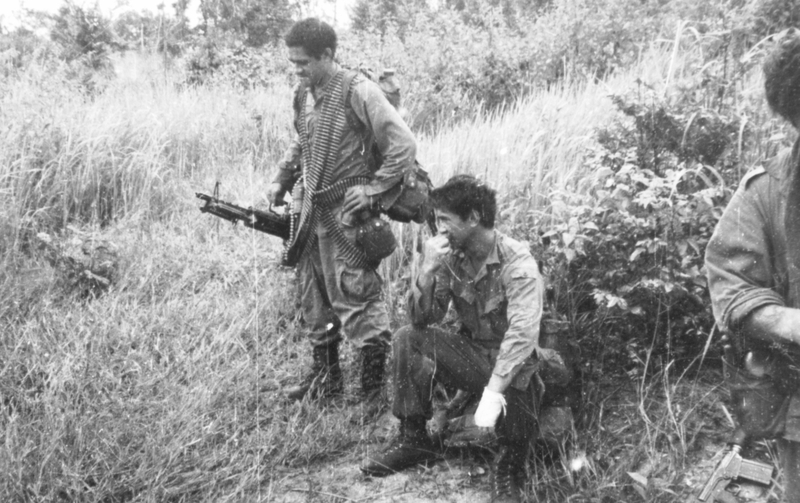 It is not indicated in the logs when the air assault started but the company was in the area of the VC camp before noon. 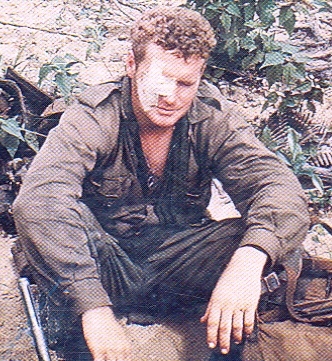 During the insertion of 2Pl Cpl Wally Goodman received eye damage from debris stirred up on the LZ. 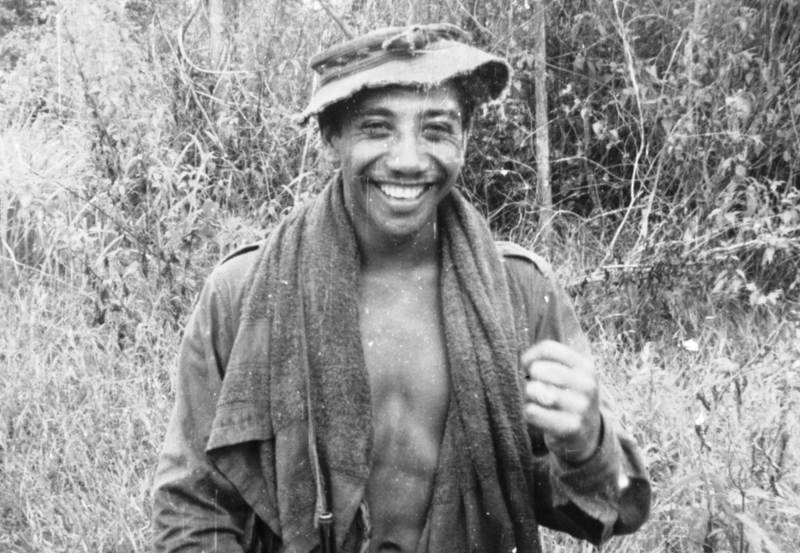 Cpl Goodman remained with 2Pl to allow them to quickly move against the suspected VC installation and the follow-up during the afternoon. 1241H locstats were Coy HQ YS345661 [remaining at this location throughout the afternoon]. 1Pl YS320664, 2Pl YS344657, 3Pl YS345661. 1800H at YS346655 2Pl finally requested a DUSTOFF for Cpl Goodman who was extracted 50' by jungle penetrator and flown to 1AFH. There had been no contact with VC. Night Location: 2Pl YS325657, some other elements appear to have been at YS350659 as a POSSUM reported a fire at that location and was advised the fire 'was W Coy burning off' [meaning burning MAINTDEM packaging]. Night Location: Coy HQ YS338675 [high in the NUI DINH feature], 1Pl YS329679, 2Pl YS338675, 3Pl YS345675. Contact: 1133H at YS342688 3Pl were halted when x5-7 VC approached their rear from the south and downhill from the 3Pl location. 3Pl waited to identify the target before firing but the VC spotted the 3Pl sentry. After 3Pl initiated the contact the VC withdrew SW, nil result. INT assessed the contact as likely having been with CHAU DUC guerrillas. Night Location: Coy HQ YS338675, 1Pl YS336684 and YS338689, 2Pl YS341695, 3Pl YS346691. W3 mor sect were in lines at NUI DAT. 0850H Coy HQ advised Bn HQ that the weather in the area was poor and that the CO would be unable to visit. 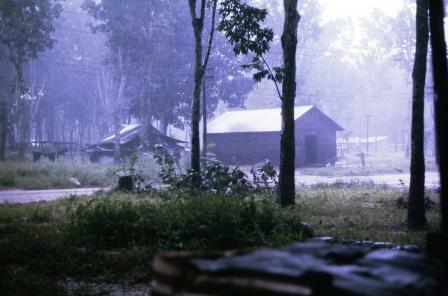 C Coy also reported similar conditions. Night Location: Coy HQ YS338675 but Sunray flew to NUI DAT at around 1730H. W Coy stretched their eastern boundary down onto the flat ground to YS376700 to YS368680, 2Pl were already in the area and actually east and outside of the new AO boundary. This is the area where 2Pl had two encounters with turtles. 1715H 2Pl were advised of a VC location at YS382655 and directed to check. A mousetrap was granted from YS376700 to YS380700 then south along and including the river to YS395654. 1906H Bn HQ advised that 2Pl postpone the camp check as US 8" arty would engage the area of the VC camp that night. 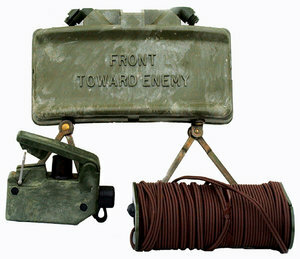 0355H 2Pl fired their claymores unexpectedly and the 2Pl MFC immediately called for an arty lay-on fire mission as was standard procedure following the initiation of an ambush, 107 Fd Bty reported ready. It was likely the MFC also reported that there was no further SA firing as would be expected following an ambush initiation. It was quickly known within 2Pl that tortoises had spooked the sentries, however this information appears to have been kept from Bn HQ and the arty fire control net, possibly also from Coy HQ. 0358H CP to c/s5 [Coy HQ] 'we have a lay-on msn from shelldrake [arty] for c/s52. Also c/s52 has fired claymores. Can you supply more info..?' / 'wait out'. 0404H Coy HQ advised the CP 'cannot give anymore info until morning'. 0810H CP was suspicious 'have you any more information..?' / 'investigation found nothing'. CP: 'was it initiated by natural causes..?' / 'we do not know'. Question: Did Lt Upton 'fess up to Sunray..? if so did SUNRAY keep a straight face when discussing with CO..? Night Location: Coy HQ YS338675, 1Pl YS348700, 2Pl YS372689, 3Pl YS349689. 0900H locstat 2Pl elm moving west then south, other c/s no change. During the afternoon all W Coy elements received their last MAINTDEM, strength states for the MAINTDEM collated and passed by the CSM to the CQMS were: 1Pl - 30, 2Pl - 28, 3Pl - 28, Coy HQ - 22 = 108 personnel in the field at the end of the tour. Night Location: Coy HQ YS338675, 1Pl YS348700, 2Pl YS372689, 3Pl YS360684. 1050H locstats 1Pl ptl YS341700, 2Pl ptl YS376685, 1110H 3Pl YS363677. 1732H CP warned Coy HQ of a VC location near YS365677 and requested advice when 2Pl could search the general area. At 1810H Sunray advised the CP 'ref checking of area in vicinity YS365677 by c/s52. The creek between c/s52 and that area is not able to be crossed except at c/s53 present location and even there a crossing is hazardous. However c/s53A has been across and checked out the area to the SE - there is no fresh sign at all. c/s53 is ambushing the only feasible stream crossing at present'. 0720H Coy HQ advised the CP that they had a U/S radio handset and requested a replacement on the POSSUM flying the CO in to meet with the OC. Pte Tom Konia 2Pl - smile sums it up..! 0855H an aircraft spotted smoke in the area of the NUI ONG CAU ridge E36-37, N66-67, at 0901H. 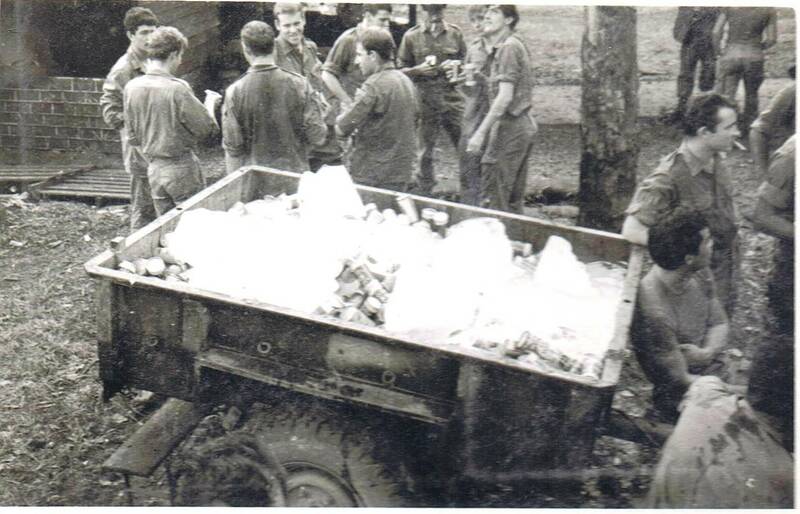 W Coy advised that one of its sub c/s had burnt off some rubbish [likely 3Pl]. 0930H the CP logs the following message: for OC from CO, on last day operations, congratulations on job well completed from rest battalion'. The message was also to be forwarded in written form to W Coy in their lines in NUI DAT. 1055H 2RAR/NZ log records W Coy as being at NUI DAT. [1240H at YS340734 1Pl V Coy advised they were in contact. Eventually at 1300H they reported a contact with x4 VC who fired at them while both parties were crossing a stream, x1 NZ KIA [LCpl M Sutherland], x2 NZ WIA [Pte R Cairns - leg wounds, Pte A Putt - facial and limb injuries]. The enemy were then reported to have withdrawn west but leaving a blood trail. 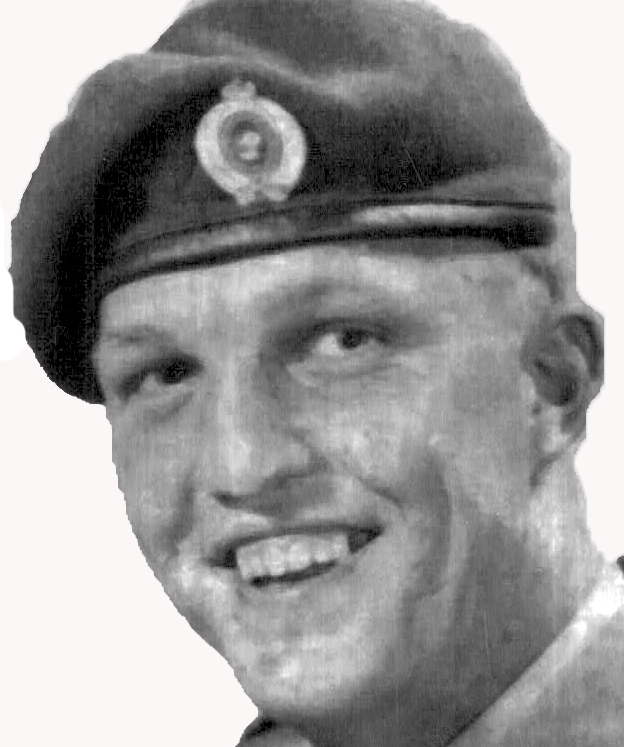 DUSTOFF was called to uplift the three NZ casualties by jungle penetrator, two IROQUOIS being required with Flt Lt Robin Klitscher RNZAF flying the 2nd aircraft that extracted LCpl Sutherland's body. The DUSTOFF of the x2 NZ WIA was completed by 1330H, Cairns going to 1AFH while Putt was flown to US 24 Evac Hospital at LONG BINH. 1Pl V Coy then reported following up the blood trail and claimed x1 VC WIA [BT]. In 1999 this 'contact' was finally disclosed amidst enormous controversy to have been a 'blue-on-blue' clash when a MG being carried across a stream accidentally discharged back into the troops, the troops and platoon hierarchy deciding at the time not to reveal the true circumstances. What is interesting is that at 1240H the CP log records OC V Coy saying 'believe there has been an accident, OC checking on other means now, wait out', this first news likely passed over the fire control radio net. At 1252H OC V Coy reported 'initial report received was there seems to be an accident, 3 of our own people hurt. 2nd report was that of a contact, at this stage [indistinct] can't raise c/s41' and then further detail requesting LFT cover. At 1300H the c/s41 SITREP offered the story about the contact which would be revealed as a lie some 30-years later. One can only reflect on the different approaches adopted by commanders between this accident and that experienced by 3Pl W Coy earlier in the month (ironically just 2Km east of the V Coy accident) and draw your own conclusions]. W3 Company held their final traditional post-operation BBQ starting around 5PM. Not surprisingly W Coy was not invited to submit a team in the BARIA Sports Carnival held 31 October - 1 November to celebrate Republic Day.